The tipping point is passed, even though when you look out your window, it seems like nothing has changed. Trump’s election was a definitive defeat for the status quo. The fact that he has turned into the sort of don’t-tax-but-still-spend profligate that would make even the most seasoned welfare Democrat blush…well, that’s beside the point. Despite uber-swamp Trump has created (welcome back, Bolton), votes for him were an attempt to drain that very swamp. There is no going back to the way it was before this reclamation of power by the powerless. The saying "the worm has turned" refers to the moment when the downtrodden have finally had enough, and turn on their powerful oppressors. The worms have finally turned against the privileged elites -- who have benefited so greatly from globalization, corruption, central bank stimulus and the profiteering of state-enforced cartels. It doesn’t matter as much as the punditry assumes whether they are turning Left or Right; the important thing is that the powerless have finally started challenging their privileged overlords. 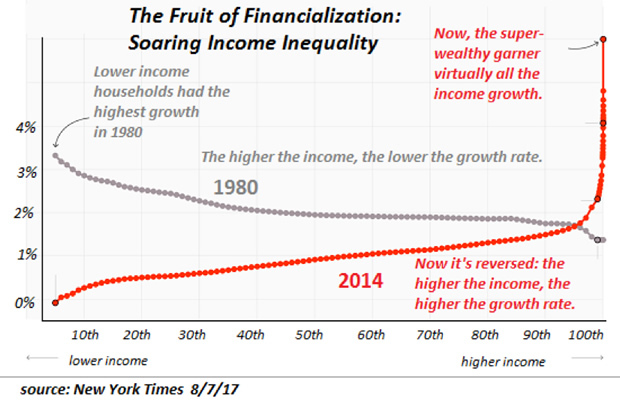 It took a generation of rising inequality, corruption and the erosion of opportunity to create a society of the protected (the haves) and the unprotected (the have-nots), and rubber-stamping more regulations and distributing Universal Basic Income (UBI) will not rebalance a system that is irrevocably out of balance. But the rise of resistance, as yet nascent, is only half the story: economic trends and cycles are turning as well, and even if the worms remain passively underground, these reversals will disrupt the status quo.